You’re on a beach in Aruba, digging your feet into the sand as the grains fall between your toes. You listen to the waves crash and smell the salt water in the air, and as you lay down to feel the sun on your chest you feel an object near the small of your back. A seashell. Distinct — beautifully shaped. If only you could wear it around your neck. Next, you’re in Morocco where arches are ubiquitous. You’re walking through the market, the scents of sandalwood and amber permeate the air, and then you pass through a horseshoe arched entryway adorned in Tastir patterns. You turn and look back in awe of its beauty. If only you could take that sculptural archway home with you. This idea is what lies at the heart of Carou Jewelry. Each piece is meant to be reminiscent of a souvenir from your travels — reminiscent of trinkets, of beautiful occurrences in nature, of memories you collect while wandering through a place that sparks wonder in your heart. 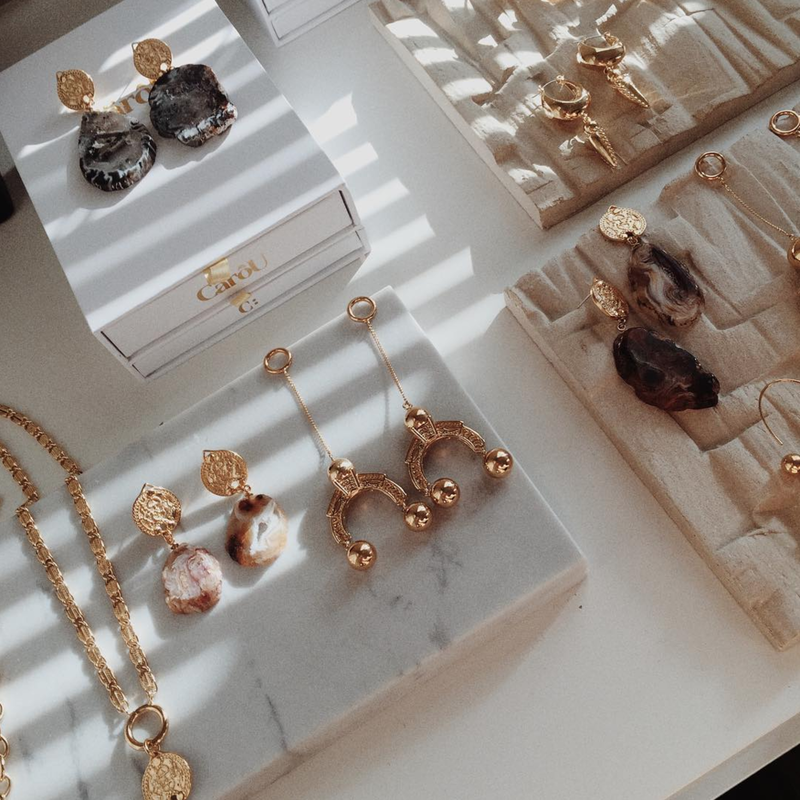 I had the extreme pleasure of chatting with Cari — the owner and designer behind Carou — to get inside the incredible mind that dreams up these little treasures. We discuss her design process, where she derives her inspiration from, and the true art in sculpting jewelry by hand. Q - Let’s start with a little insight into your personal backstory. How did you first get into designing jewelry? A - I've always had a thing for art and sculpture. After school I didn't quite know how to channel my creative energies, so I drifted into fashion design. I worked in the fashion industry in London for several years but there was always something about it that never quite clicked with me. I left London in 2012, searching for something different, and it took me a while to find my place. I travelled through Europe, Asia and Indonesia, finally ending up in Sydney, Australia. It was there that I found my first job in jewelry, working for a small design studio that handcrafted everything in house. They used artisan techniques and long-lost methods and I learned the craft of hand-sculpting metal, making moulds and casting. The small studio environment fostered a lot of creativity. Often jewelry design can be seen as a very precise practice, but we worked very organically and new concepts were always encouraged — if I could sculpt it, we could make it! It was only after discovering the niche of jewelry and the beauty of metal working that it suddenly all fell into place for me! Q - How long has Carou been around? A - I started Carou in California at the beginning of last year. I had just moved to America from Sydney, and as much as it broke my heart to leave the tranquil paradise that is Australia, I was excited about being based on the West Coast of the States. There are so many exciting things happening in jewelry there at the moment. For me, it’s where it all cool and beautiful things are coming from right now and I wanted to make the most of being in such a creative and high energy place. There are so many talented people to collaborate with here as well, it all kind of feeds into one another and feels very dynamic. It felt like the right time to start Carou. Q - Your jewelry is unlike anything we’ve ever seen before! Where do you derive the inspiration for your Carou designs from? A - There have always been three things I have been obsessed with; art, literature and travel. And in jewelry, I have somehow found a way to bring those three loves together. I knew I wanted to create a brand that had telling stories, emotion and beautiful objects at heart. All my designs are inspired by travel and nature; they are souvenirs of places I have been and represent particular moments in time. I am inspired by hidden stories and romances of the world, and every piece I make reflects my obsession; old stories told in new ways for the modern world. I see jewelry as an art form and most artists have a unique vantage point of their own work, much like l do. The designs are an expression of me but also aim to target what l feel is lacking in the market at the moment - honest, curious designs. Q - Who do you design for? What kind of lady (or man) do you have in mind when you dream up your creations? A - The Carou woman is grounded, feminine and connected to nature. Jewelry is so personal, it really takes on new meanings for each wearer and it can become a part of who you are. So I like to think my jewelry will mean different things to different people. It does not always have to tell the same story. I love that people become so attached to jewelry. They will change their clothes every day, but its often the same jewelry day in and day out, because it has become meaningful, charged with memories and experiences. I know that I wear jewelry because it gives away a little part of who I am and what’s inside. But not too much! Q - What is your creative process when designing a piece, and what are the things you always take into account when creating (how it will fall, where it will hang, how it hugs the curves and shapes of the face/body, etc.)? A - One of the reasons why I really connected with jewelry design was the lack of constraints in comparison to fashion design. With clothing, your design has to fit around the body and move in certain ways; there are only so many shapes you can come up with that are wearable and comfortable. With jewelry, I feel you can be so much more creative. But yes, there are certain things to always consider… there is nothing worse than a pair of earrings that are divine to look at but too heavy to wear! Q - How long does the design process for a single piece usually take, from inception to finished product? Is it amazing to see your little dreams come to life? A - The design itself is a fairly quick process for me, as I tend to work on instinct. I hand-make all of my prototypes using raw metals – soldering and twisting and chiseling until I find the right look. In the past I have tried to sketch my ideas first, but I have found over time that my best ideas come when I have the metal in my hands and I’m just seeing what it can do. After I have the design figured out, the hard part begins! Jewelry development is notoriously slow. It takes time to make CADs, translate them to moulds, then cast the components. There are a so many steps involved, particularly with my designs as they involve lots of intricate hand assembly after casting. So there is always a bit of a wait. But when you do finally see your creations fully realized and beautifully executed it is a very fulfilling moment. Q - It’s clear that you use premium materials for your designs, how do you go about choosing and sourcing your materials for Carou? A - I love using elements from nature in my work, and I often find myself in Arizona on the hunt for beautiful stones and natural treaures. I sourced the Amethyst stones for our Roca earrings from an amazing gem fare in Tuscon last summer. There must have been a million stones in Tuscon that weekend, but the ones I found for Roca were just mesmerizing. They are like whole landscapes trapped inside tiny pieces of rock, and I can look at the detail and colours for hours on end. It kind of blows my mind that mother nature can create something so perfect, purely by accident. And true to the Carou brand ethos of travel and adventure, we always try to work our sourcing expeditions around a roadtrip! That particular weekend we hired a car and drove through the Arizona desert, just in awe of the land! My friends often make jokes that all my holidays are roadtrips and I spend too much time in the car looking out of the window instead of staying in one place and relaxing. I guess its true. Q - We know that minimal jewelry has been in style for quite some time now (and will likely never go out of style), so it might be the safer choice when creating a line of jewelry. But we don’t consider your pieces minimal at all. While Carou is still very timeless and classic, all the pieces make a statement. How do you find that balance? A - You are right, minimal jewelry has been the go for quite some time, but we are slowly seeing the re-emergence of statement jewelry now, particularly statement earrings which are the ultimate accessory in the selfie era. Whilst acknowledging trends is essential, with Carou I wanted to create pieces that were authentic to my own vision. It may sound self-indulgent, but I only design pieces I want to wear myself. If I come up with something that I like but I wouldn’t really wear it, it gets cut! Also, trends come and go. Over past years we’ve had everything from the barely-there fine jewelry to retro eighties resin. You can exhaust yourself trying to follow every trend out there, or you can stay true to your own aesthetic. I try to do the latter, whilst keeping an eye on the former. Q - What is something really interesting about designing jewelry that people wouldn’t ever really know? A - You need to be flexible and accept the beauty in imperfection! Jewellery is all about using materials from the earth to create beautiful objects – metal, stones, shells, pearls. And by nature, they can be different from day to day. The way a material heats and sets one day may be different to another. A slice of amethyst found last week may be more translucent than the one found today. But that’s why I love it. Every piece has its own story to tell. Q - We know you’re new to Instagram, but we love your feed already! It has a cohesive and distinct vibe, and it is reminiscent of a moodboard, in our opinion. Can you tell us about your vision with your Instagram and how you go about deciding what to post and creating the content you post? A - Thank you! For upcoming brands today, Instagram is their best portal to the rest of the world. And luckily it really lends itself to creative pursuits, because its such a visual tool. I use Instagram to tell the story of Carou – its almost a diary of sorts. Places that struck a chord with me, moments that inspired something, colours that clicked with me. I love the ever-changing nature of Instagram, and its immediacy. It is a true record of whats happening with Carou and I in that moment, and for me that personal touch is important. Q - Do you have any advice for anyone who wants to get into jewelry design? A - This advice is not exclusive to jewelry design, but I’d say – learn the rules before you break them. Making jewelry is a real craft, and sometimes it not only about your imagination and eye, but having a great knowledge of what you can and can’t achieve. There is usually a bit of science and method behind the madness, whether that knowing the melting points of various metals, or which kind of moulds will produce the finish you want. I’d say learn how your materials work first, but that after let your creativity run wild. Q - Who are 5 people (dead or alive) you would invite to your dinner party? And I would choose one very lucky person I know to take with me... after all, you would need someone to debrief that incredible dinner with afterwards.